It's October which means that it's time for... no not candy! It also doesn't mean it's time for costumes. October means that it is time to once again hold screenings for the incredible family cinematic adventure The Nightmare Before Christmas! Ok, maybe it's only our family that calls it that but I can say that there is no other Halloween/Christmas mashup movie that comes close to beating it. We are already singing the soundtrack together as a family. So in honor of October, I had to make my kids this Jack Skellington lunch to celebrate! If you have been around my blog at all, you know this isn't the first time I've gone with this theme. I have a few other Nightmare lunches that you can find HERE. 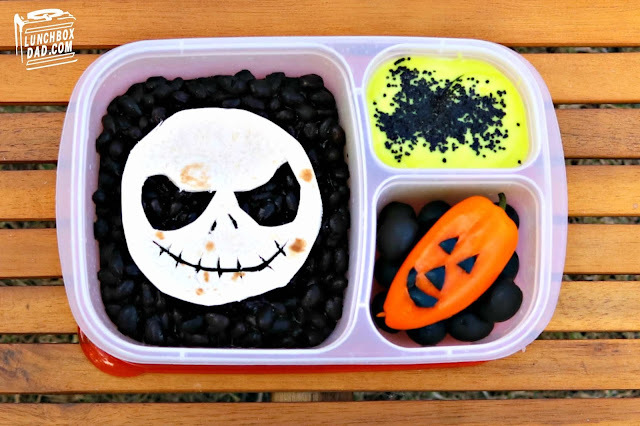 This particular lunch was made in an Easy Lunch Boxes container and is complete with a Jack Skellington bean burrito and Oogie Boogie yogurt! See the instructions below. 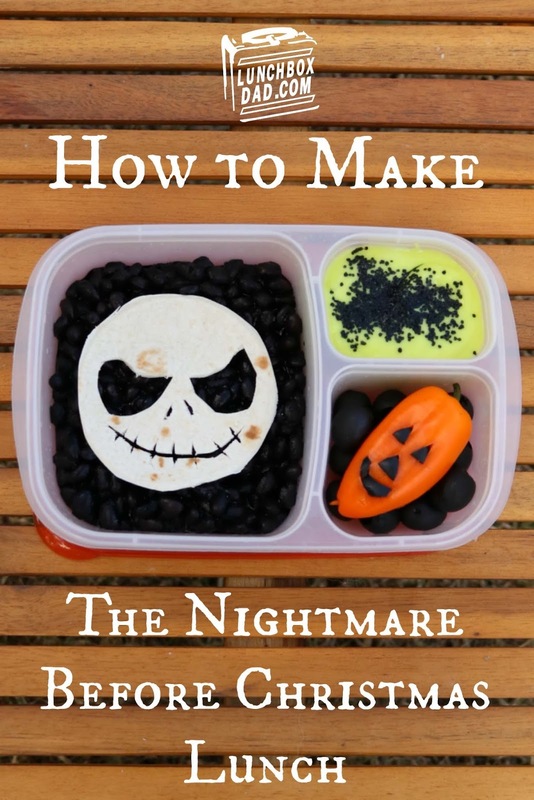 Ingredients: Flour tortilla, black beans, sliced cheddar cheese, black olives, orange sweet pepper, greek yogurt, green food coloring, black sprinkles. 1. Lay slices of cheese on the bottom of main compartment. Spoon black beans on top. Cut flour tortilla in the shape of Jack Skellington's face and place on black beans. This can be made into a burrito or the Jack tortilla can just be dipped in and the beans eaten with a spoon. 2. Dye yogurt green and place in side compartment. 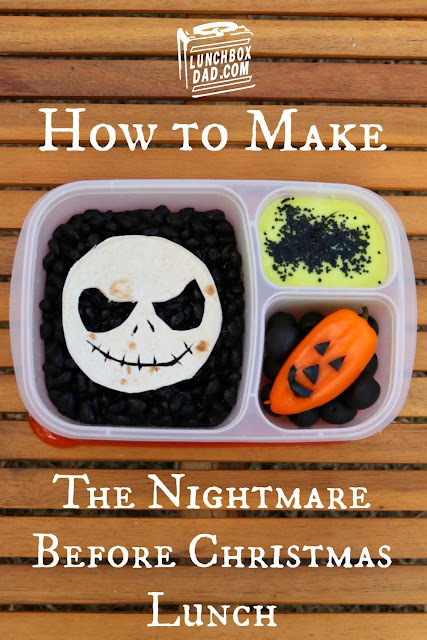 Drop black sprinkles on top to make an Oogie Boogie themed yogurt. 3. Cut a Jack O' Lantern face out of an orange sweet pepper. 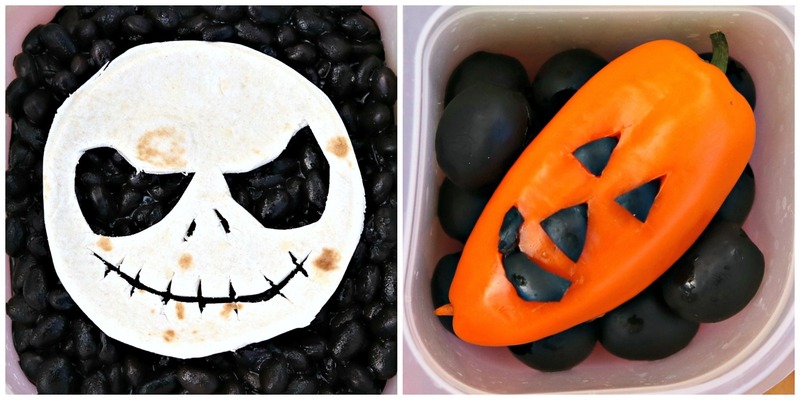 Fill holes with pieces of black olives. Place olives and pepper in other side compartment. 4. Enjoy The Nightmare Before Christmas over, and over again!